NOTE: Text and photographs by Asitha Jayawardena (http://uk.linkedin.com/in/asithaj) as part of his Sustainable University One-stop Shop Experiment (http://www.sustainableuni.kk5.org/). Goal-posted doorways and wedding cake were among the bizarre themes that surfaced at a panel discussion on the role of the Sustainable Development Goals (SDGs) in supporting and promoting a more sustainable world held at London South Bank University (LSBU) on 28 June 2018. Titled ‘The Sustainable Development Goals (SDGs): from Global to Local’, the discussion was hosted by LSBU Sustainability Research Group of the Centre for Social Justice and Global Responsibility. The event was chaired by Dr Hugh Atkinson (Senior Lecturer in Politics and Public Policy), who is a Member of the Sustainability Research Group as well as the Management Group of the London Regional Centre of Expertise (RCE) on Education for Sustainable Development (ESD). The presentations session of the three panellists was followed by a Q&A session, which generated interesting discussions with active participation of the 50-strong audience who had sacrificed the live coverage of the England-Belgium World Cup match! SDGs are a woven web. One cannot talk about one goal, ignoring the other sixteen. Systems thinking can help us understand the world as an interconnected whole – a fact that the SDGs illustrate so vividly. The SDGs ‘wedding cake’, developed by the Stockholm Resilience Centre, puts the Global Goals into perspective, implying that economy and society are embedded parts of biosphere. This caky model illustrates the fact that ecological limits form basis of the SDGs. SDGs can act as doorways to the world of sustainability. For academics, Goal No 4 Quality Education could be the main doorway. In Goal 4 Quality Education, what does quality mean? Quality education means sustainability and education with values. Moreover, not only the content but also the process (i.e. how it is delivered) would be important. We need the support of all sections of society to achieve the SDGs by 2030. For instance the corporate sector has the cash and the governments have the legal frameworks. Different sectors can play different roles in this endeavour. Many people think that government should act on SDGs or business should but we as individuals cannot have an impact. We should not feel disempowered. For instance the plastics issue has generated a huge civic demand for action by all. How to engage all sections of society with SDGs? The environmental/ sustainability movement has been hindered by a communications problem and SDGs endeavour could suffer from the same illness. To engage all with SDGs, we must speak in a language that they can understand. The discussion was followed by a reception for networking. NOTE: Sustainable Development Goals (SDGs): The 17 SDGs that the 193 member states of the UN signed up to in 2015 are ambitious in scope and, when taken together, they represent a real opportunity to develop a global strategy for localities to fight poverty and global inequality, and to tackle climate change and protect the environment. The third meeting of the LSBU Sustainability Research Group, chaired by Professor Ros Wade, was held before this event. Launched in November 2017 and hosted by LSBU School of Law and Social Sciences, the Sustainability Research Group on Policy, Practice and Pedagogy aims to achieve sustainability through research, education and action. The group aims to develop and promote research and action on sustainability as a new and emerging interdisciplinary area, drawing from the social sciences as well as other disciplinary landscapes in order to address the complex, real-world wicked problems of today, such as climate change, global inequality, forced migration, biodiversity loss, social and environmental justice. Framed within the context of UN Sustainable Development Goals (SDGs) and UNESCO’s Global Action Plan (GAP), the group’s work is linked to the Centre for Social Justice and Global Responsibility at LSBU’s School of Law and Social Sciences. Moreover, building on the work of the London Regional Centre of Expertise (RCE) on Education for Sustainability (EfS), which is hosted at LSBU, the group links with the wider global RCE network of the UN University and UNESCO networks. Note: Logos in the graphic are from respective websites. STORY | A game of plates at ‘Growth vs. Earth’ Café | Who depends on whom? NOTE: Text and graphics by Asitha Jayawardena (http://uk.linkedin.com/in/asithaj) as part of his Sustainable University One-stop Shop Experiment (http://www.sustainableuni.kk5.org/). London South Bank University’s Sustainability Research Group of the Centre for Social Justice and Global Responsibility will host a panel discussion on Sustainable Development Goals (SDGs) at the university (Room DC12/13 in the Clarence Centre) on Thursday 28 June 2018 from 5 to 6.30pm. Hilary Macleod (Environmental educator and consultant from Queensland, Australia): Has worked with a number of key global agencies including UNESCO. Dr Katherine Eames (Senior Sustainability Project Officer at the Greater London Authority): Currently co-ordinates the pan-London Mayor’s Entrepreneur competition, which supports London’s students to come up with innovative solutions for London to reduce carbon emissions. Dr Paul Vare (Senior Lecturer, Research Development, School of Education, University of Gloucestershire): Has extensive international experience in the field of sustainability and his research and teaching specialism is the area of education and sustainable development. The discussion will be followed by a reception for networking. The 17 SDGs that the 193 member states of the UN signed up to in 2015 are ambitious in scope and, when taken together, they represent a real opportunity to develop a global strategy for localities to fight poverty and global inequality, and to tackle climate change and protect the environment. The group develops and promotes research and action on sustainability as a new and emerging interdisciplinary area, drawing from the social sciences as well as other disciplinary landscapes in order to address the complex, real-world wicked problems of today, such as climate change, global inequality, forced migration, biodiversity loss, social and environmental justice. 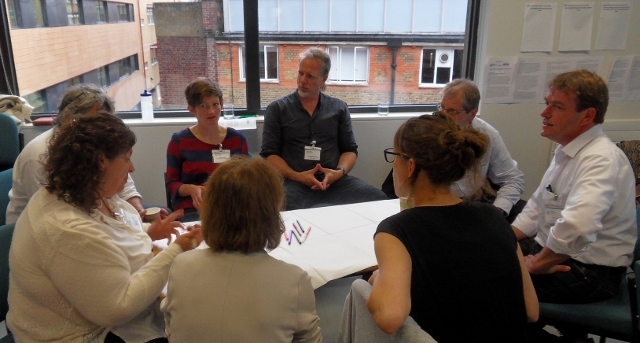 Building on the work of the London Regional Centre of Expertise (RCE) on Education for Sustainability (EfS), which is hosted at LSBU, the group also links with the wider global RCE network of the UN University and UNESCO networks. NOTE: Text, photographs and graphics by Asitha Jayawardena (http://uk.linkedin.com/in/asithaj) as part of his Sustainable University One-stop Shop Experiment (http://www.sustainableuni.kk5.org/). Logos are from websites of LSBU and RCE London. 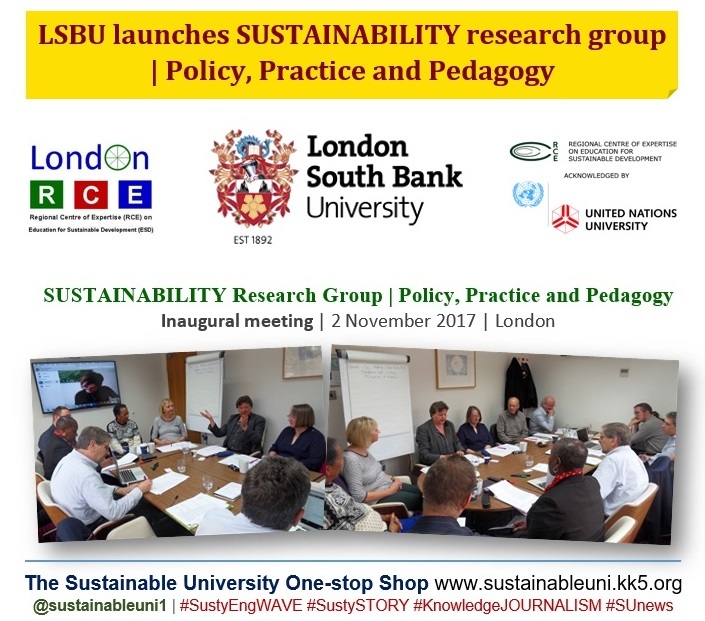 London South Bank University (LSBU) launched a research group, ‘SUSTAINABILITY: Policy, Practice and Pedagogy’, in London on 2 November 2017. Hosted by LSBU School of Law and Social Sciences, this Sustainability research group aims to achieve sustainability through research, education and action. The group will develop and promote research and action on sustainability as a new and emerging interdisciplinary area which draws from the social sciences as well as other disciplinary landscapes in order to address the complex, real-world wicked problems of today, such as climate change, global inequality, forced migration, biodiversity loss, social and environmental justice. Framed within the context of UN Sustainable Development Goals (SDGs) and UNESCO’s Global Action Plan (GAP), the group’s work will be linked to the Centre for Social Justice and Global Responsibility at the School of Law and Social Sciences. Building on the work of the London Regional Centre of Expertise (RCE) on Education for Sustainability (EfS), which is hosted at LSBU, the group will also link with the wider global RCE network of the UN University and UNESCO networks. Led by the group’s lead academics – Professor Ros Wade (LSBU Education for Sustainability EfS programme/ London RCE), Dr Glenn Strachan (LSBU EfS programme) and Lynn Vickery (London RCE) – the inaugural meeting was attended by academics from LSBU, the University of East London (UEL) and the University of Gloucestershire. At this meeting, the participants developed a combined vision and sense of purpose in line with the Centre for Social Justice and Global Responsibility, developed a two-year research strategy for the group and a timetable of actions/ events for 2017-2018, and planned a publication or a journal on addressing the themes of the SDGs. As an active leader in sustainability in UK higher education, LSBU hosts the RCE London, which was launched at the university in 2009. With RCE London, it hosted European RCE meeting 2016 on 23 and 24 June 2016.
Notable among other conferences that the university has co-hosted with RCE London is the ESD London Conference 2014. LSBU is also home to the pioneering masters course in Education for Sustainability, which celebrated 21st anniversary in early 2017. The university also hosts seminars by sustainability leaders and an example is the talk by eminent environmentalist and writer Jonathon Porritt CBE in 2015. 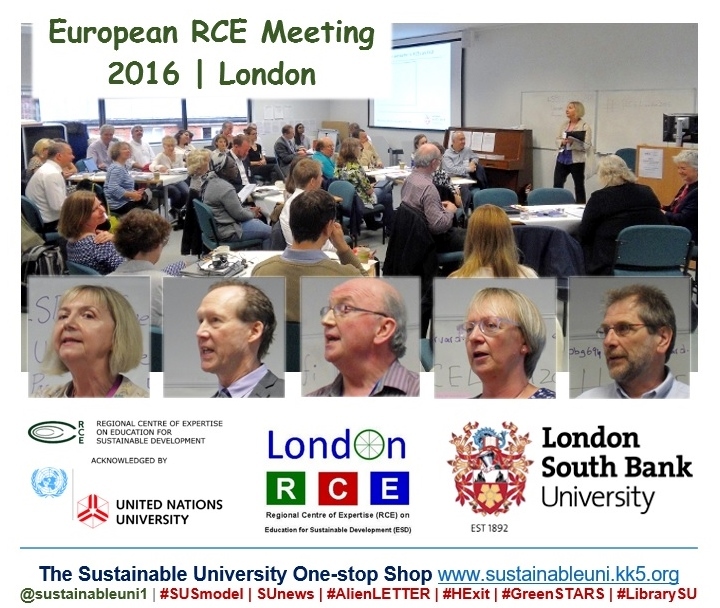 The European RCE Meeting 2016 (#RCELondon2016) took place at London South Bank University (LSBU) on 23-24 June 2016. Hosted by LSBU and the London Regional Centre of Expertise (RCE) on Education for Sustainable Development (ESD), this two day event was attended by nearly 50 participants and most were representatives from 17 RCEs across Europe, which are part of the global RCE network of the United Nations University. The first day of the meeting began with a brief outline by Professor Ros Wade (Chair, RCE London) and Professor Pat Bailey (Deputy Vice Chancellor and Sustainability Lead at LSBU) welcomed the participants to LSBU. During the day, the participants focused on finding synergies in the European RCE community and on tackling thematic challenges under the current policy frameworks COP21, SDGs (Sustainable Development Goals) and TTIP. Moreover, they strived to identify the roles that RCEs can play in the GAP (Global Action Programme on ESD) and SDGs while exploring opportunities for collaboration within RCEs and beyond. They also considered the challenges that lie ahead. In the meantime, they did not forget to share and celebrate the excellent work that European RCEs are doing across the continent, sometimes with non-European partners. Poster session: RCEs – state of the art: What is going on in Europe? Day Two, with a focus on celebrating Refugee Week, mainly comprised a workshop and discussion forum on the issue of migration and refugees and implications for the role of RCEs. A draft position paper ‘Education as a Tool for Responding European Refugee Crisis’ prepared by Dr Pinar Guner (LSBU) was discussed by the participants. A report of the meeting was sent for dissemination by the RCE Service Centre. The next European RCE meeting will be hosted by RCE Dortmund in Germany in 2018. Rio+20 Treaty on Higher Education: Engaging Communities of Learning in Change for Sustainability, a side event of the 6th International Barcelona Conference on Higher Education organised by the Global University Network for Innovation (GUNi), will be held at the Universitat Politècnica de Catalunya, in Barcelona on 13 May 2013. This event, co-organised by COPERNICUS Alliance and the United Nations University Advanced Studies Institute (UNU IAS), through its Regional Centre of Expertise (RCE) initiative, aims to discuss the Rio+20 Treaty on Higher Education and to share innovative practice in sustainability in higher education. The event’s outcome will be a publication to be launched at the end of the year. 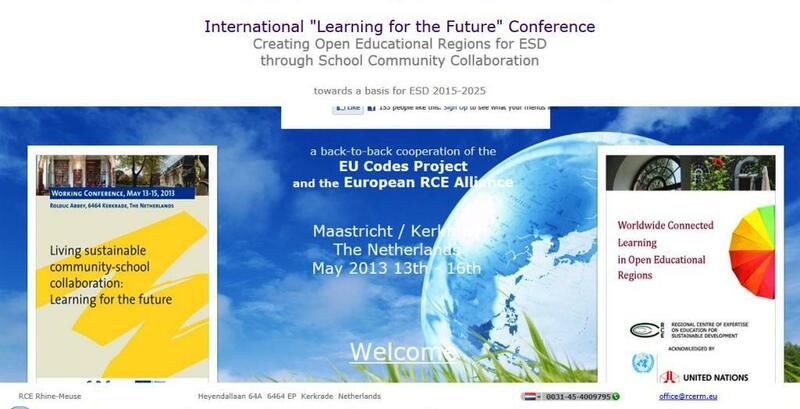 International “Learning for the Future” Conference on Creating Open Educational Regions for ESD (OPEDUCA) through School Community Collaboration (CODES) will be held in Maastricht / Kerkrade, The Netherlands from 13 to 16 May 2013. A cooperation of the EU Codes Project, the European RCE Alliance and Environment and School Initiatives (ENSI), the conference will focus on the relevance and working of Education for Sustainable Development (ESD) in the region. Working towards the 2015-2025 era (i.e. the aftermath of the UN Decade for ESD 2005-2014), the conference will take up initiative to explore, share and formulate a joint vision to take ESD further. Is your organization interested in joining the global network of Regional Centres of Expertise (RCE) on Education for Sustainable Development (ESD) developed by the United Nations University? The UN University is now accepting applications for RCEs and the deadline for expressions of interest is 15 April 2013. An RCE is a network of existing formal, non-formal and informal education organizations that deliver ESD to local and regional communities. 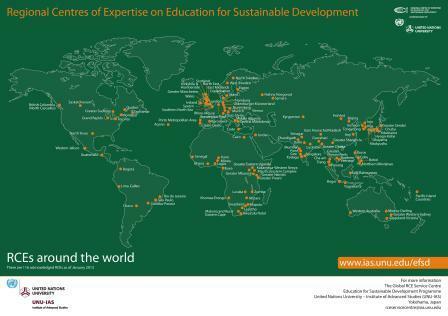 The 116 RCEs (as of January 2013) worldwide that make up the Global Learning Space for Sustainable Development are translating the global objectives of the UN Decade of Education for Sustainable Development (DESD, 2005–2014) into their respective local and regional contexts. London, the first European capital city to set up an RCE, joined this global network in 2009.